The Gila Monster is hard to find in the desert. This is because its color allows the Gila Monster to blend in with the rocks and sand. It also has black eyes that help it blend in with its body as a protection for predators. Since the Gila Monster is extremely slow moving, it needed adaptations for defense purposes. One is the armor protected skin. 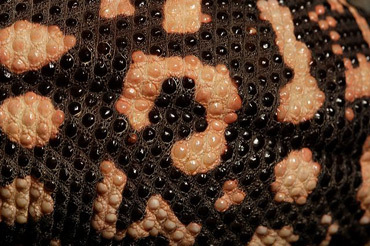 Gila Monsters are beaded-skinned lizards, meaning each bead covering its body contains a small bone. These are called osteoderms and they protect the Gila Monster from its sharp teethed enemies. Below is a close-up of the osteoderms. Gila Monsters are rarely found during the winter. This is because they enter a state of hibernation during the winter months. They rest in huge burrows, often including other lizards, rattlesnakes, and turtels.